Ha! My coworker told me about this a while ago and we were watching the ad online! It's insane. We especially love how they make it look soooo hard to put a regular doggy sweater on him (in black and white shots), but with the Snuggie it's SO easy (in vibrant color of course). Dogs in clothes kind of freak me out so Toby has a little sweater (that he doesn't like too much) and that is it. Once I was walking through Times Square during my lunch break and my coworker and I saw a big greyhound (I think it was) in a sweater...with long sleeves...and a freakin scarf! I wonder if they get made fun of by their other dog friends. 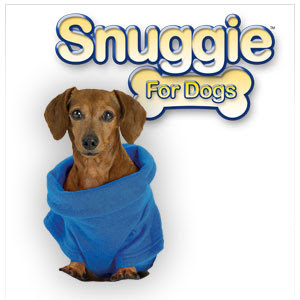 I think Charcoal needs one of these because we snuggle up on the couch every night after work. Ahh, dogs in clothes make me smile. My husband and I always get a kick out of the snuggie ads where the people are wearing them OUT IN PUBLIC and look like druids at a football game! Ok... that dog in the snuggie looks like its in a trance... i think it was coerced into that thing so it could join the rest of the snuggie cult (which is just a backwards bathrobe!!). ps. your dog is sooo cute! Dorkys-It is funny how they make their Snuggie look so easy! I used to think dogs in clothes were so Paris Hilton. 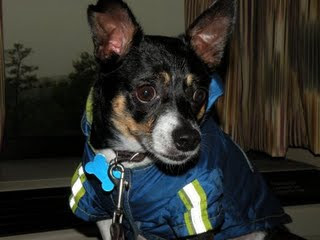 When we first got Bark though, he was so little and always freezing, I guess that was the chihuahua part of him coming out. That was what started him with the clothes and now he has a whole wardrobe! LOL! Boy that would have to be a really big sweater for a greyhound! Plus a scarf! LOL! If I put a scarf on Barkley it would be completely shredded before we got out the door! That is funny about getting made fun of. Last December we went to Tennessee to see my family and a pitbull almost got Barkley. It was horrible, but my uncle is such a nut he was trying to make me laugh afterwards, which was not easy let me tell you! Barkley had a camo jacket on with fuzzy stuff on it. My uncle said, "Well, I know why they tried to attack our boy Barkley! They ain't never seen such a wussy looking dog around here!" maggiemay(mom)-I think Charc and Bark have enough blankets to their names! They are both spoiled to death! LOL! Thank you! I love that pup! I work with dogs in my day job and I have to say - I've heard some crazy things. This woman came in asking if we sold wedding gowns and tuxedos for dogs. She wanted her dogs to be married before she bred them! What?! hahaha oh my goodness dogs in clothes are so funny. i'm totally getting one of these, even if my little wiener dog will only wear it for 2 seconds.